Back to top ↑ Arlington ISD > Congratulations Area 7 and Area 8 Spelling Bee winners! Congratulations Area 7 and Area 8 Spelling Bee winners! Congratulations to all of the students who participated in the 2018 Area 7 and Area 8 Spelling Bee on Wednesday. Area 7 winner was Jolene N. from Duff Elementary and runner-up was Priyanka P. from Swift Elementary. Jolene spelled “competitive” correctly in the 29th round. 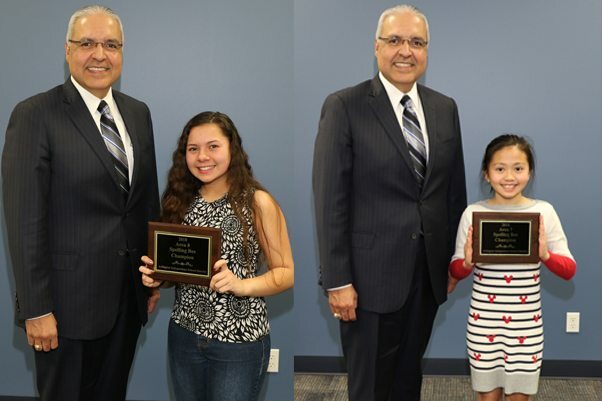 Area 8 winner was Haley W. from Shackelford Junior High and runner-up was Nathania U. from Larson Elementary. Haley spelled “peloton” correctly in the 18th round.